Remember those colorful Playmobil blocks that we used to stack as toddlers? Well urban intervention experimenters City Leaks have constructed a life-size version in Melbourne for adults! Dubbed PlayMo, the outdoor pavilion was constructed from out-of-use milk crates, and is open to the public to explore and enjoy just like kids would a jungle gym. Check out the pics, and you'll see that people have gotten so comfy inside PlayMo that they've even brought their pillows. City Leaks used three different colors of crates and gave each one a specific function. The idea reminded us of the classic game of Tetris – remember that each type of block cluster was a particular color and shape? In PlayMo, the black crates = platforms, the grey crates = stairs and finally the green crates = moveable elements. 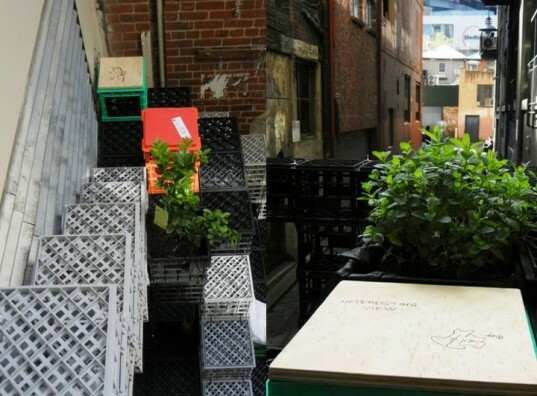 The green crates are the most interactive pieces and provide an undefined random element; visitors can create their own seating arrangements or sofas or even stack crates to make additional steps. And it’s apparent from the photos of PlayMo showing how the pavilion evolves from one day to the next that people love putting their own special touches on the space. City Leaks found plants, art, toys, coins, letters and even pillows left inside and atop the crates. It’s just like when we were kids and you had a box, sheet and some imagination. You were either in a spaceship, a fort or car. We doubt there will be anyone pretending to defend a fort here, but that still looks like it’d be a great place for a nostalgic rest. City Leaks used three different colors of crates and gave each one a specific function. The idea reminded us of the classic game of Tetris - remember that each type of block cluster was a particular color and shape? In PlayMo, the black crates = platforms, the grey crates = stairs and finally the green crates = moveable elements. 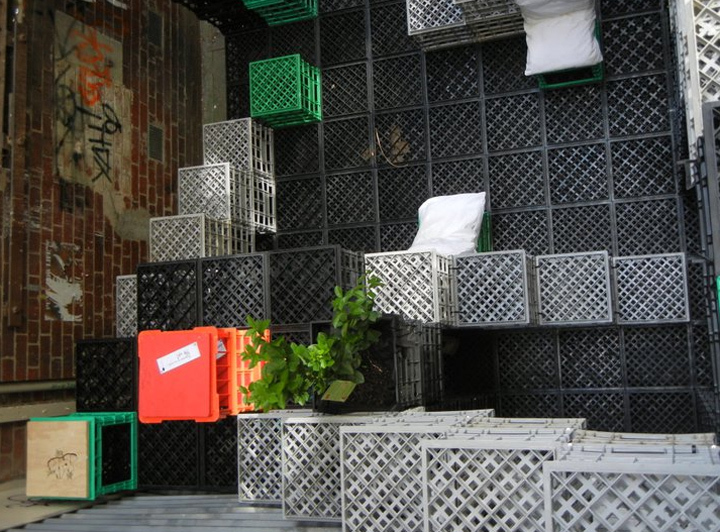 The green crates are the most interactive pieces and provide an undefined random element; visitors can create their own seating arrangements or sofas or even stack crates to make additional steps. And it's apparent from the photos of PlayMo showing how the pavilion evolves from one day to the next that people love putting their own special touches on the space. City Leaks found plants, art, toys, coins, letters and even pillows left inside and atop the crates. "PlayMo was born from the intention of inventing a space that turns into a place where people meet, spend time and play," explain City Leaks of how the pavilion came to be. "Its name comes from “playmobil”, a Lego styled child’s creative play toy. Using milk crates was like playing with big Lego pieces. Milk crates are a fantastic material for many reasons; they are structural, light, modular and they have an iconic role in Melbourne’s cafe image and laneways. We believe that familiarity to a material plays an important role in engaging with it."